Figure of a fuel cycle to present the main idea of ALFA-BIRD. 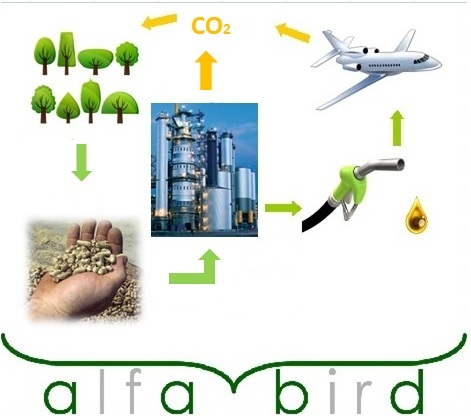 Description: ALFA-BIRD (Alternative Fuels and Biofuels for Aircraft Development) is a project co-funded by the EU in the 7th Framework Programme for Research and Technological Development, started in July 2008. ALFA-BIRD is an R&D project aiming at viable technical solutions. Its objective is to investigate and develop a variety of alternative fuels for the use of in aeronautics, motivated by the need to ensure a sustainable growth of the civil aviation, regarding the impact of fossil fuels on climate change, and in the context of oil prices that are highly volatile and increasing in the long term. The main challenge in the project work is developing fuels that meet the very strict operational constrains in aviation (e.g. flight in very cold conditions), and are compatible with current civil aircraft, which is a must due to their long lifetime of almost 50 years. To address this challenge, ALFA-BIRD gathers a multi-disciplinary consortium with key industrial partners from aeronautics (engine manufacturers, aircraft manufacturers) and fuel industry, and research organizations covering a large spectrum of expertise in fields of biochemistry, combustion as well as industrial safety. Bringing together their knowledge, the consortium will develop the whole chain for clean alternative fuels for aviation. The most promising solutions will be examined during the project, from classical ones (plant oils, synthetic fuels) to the most innovative, such as new organic molecules. Based on a first selection of the most relevant alternative fuels, a detailed analysis of up to 5 new fuels will be performed with tests in realistic conditions. EU-VRi Specific Role: EU-VRi is the coordinator of Alfa-Bird and takes care of the overall management of the project - Technical management with the support of the Steering Committee as well as administrative / financial co-ordination of the project. By providing its expertise in Life Cycle Analysis (LCA), Life Cycle Costing, Multiple Criteria Decision Making, Decoupling Indicators, etc., EU-VRi is also reponsible for the economical evaluation of the use of alternative fuels. This economic analysis aims at a cost evaluation together with an evaluation of expected market availability, in order to gain insights into market expectations.